OK. This is my personal opinion but I do hope that it will help you to decide which one would be more suitable for you, or just buy both If you are a makeup junkie (like the person writting this) (;. If you would like to know more detailed information about them, then check out my earlier blog posts. This is a conclusion and more personal impressions kind of review. The first difference is pretty obvious. The packaging! While the original Naked palette has a velvety, feminine exterior (which is more appealing to me), the Naked 2 palette is in a metal tin. 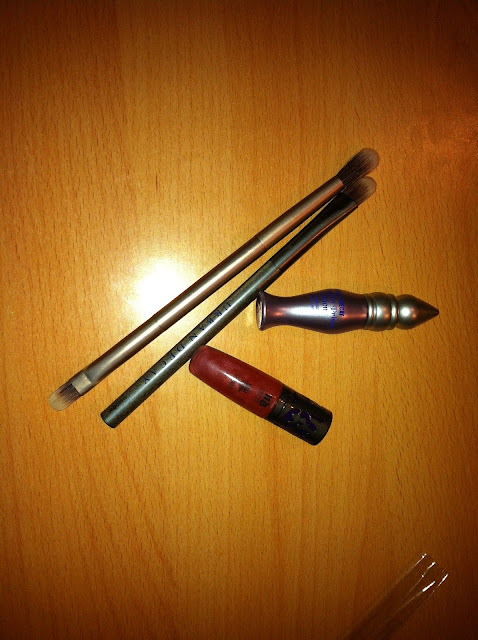 It is very sturdy and provides excellent protection for the eyeshadows inside of it. It doesn't mean that the original Naked palette is less travel friendly. I brought it with me on my trips many times and had no problems. It has a magnetic closure but it holds really well. Secondly, Naked 1 first came with eye liner pencils which, unfortunately, aren't sold with it, anymore. Now you get an eyeshadow brush that I am not a fan of. I prefer the double ended brush that comes with Naked 2 because of the blending side. It is very soft and does a good job. Both palettes contain 12 eyeshadow shades, and there is only one shade repeated in the second palette, and that is half baked. At first I didn't understand why they repeated that colour but then I did some research and realized that many people say that that is their favourite UD eyeshadow. I am not one of them. It is a nice, versatile colour but not my favourite colour from UD. Both palettes come with a mirror. 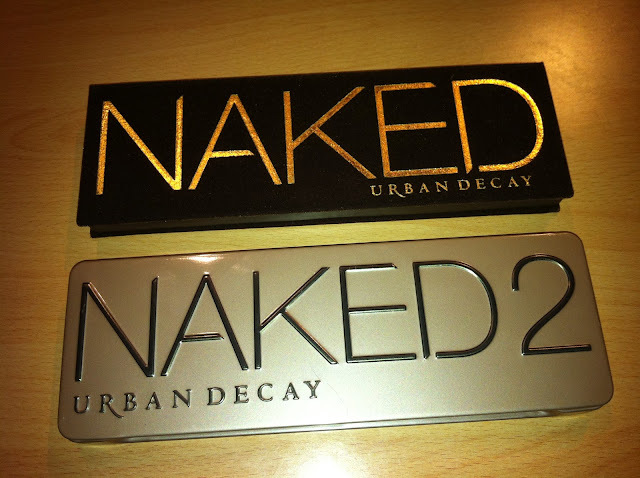 The one in the Naked 1 is a nice size mirror but the one in Naked 2 is huge. Then, the "presents" that come with them are UD primer potion with Naked 1 and UD Lip Junkie lip gloss with Naked 2. I think that UD primer potion is a better deal because you will use it every day since it is appropriate for any makeup look, it is one of the best eyeshadow primers on the market and it is also one of the best selling product from UD in general. On the other side. UD Lip Junkie lip gloss is nothing special. I wouldn't buy it separately and one thing that I would point out as a plus is the fact that it is not sticky. Well, if you love neutral looks with a nice all over lid colour, with just a little eye liner, not as smokey, you'll love the Naked 2. 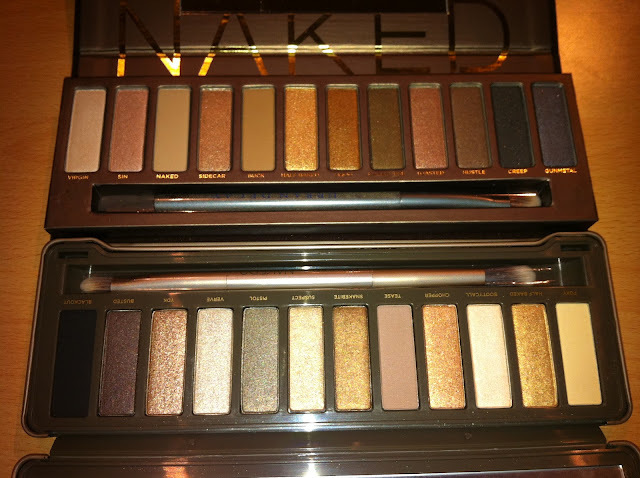 But if you are a smokey eye lover, I sugest Naked 1 because it offers more colours to do it. The matte black in Naked 2 is a wonderful and pigmented shade which everyone will appreciate in their collection but I think that most people won't use a matte black for doing day time smokey eye. It is great for tightlining or for softening eye liner, and it can be used for smokey eye but more for evening makeup looks. Most of us apply makeup early in the morning (for work or school) and we just don't gravitate towards matte black eyeshadows then. Naked 1 offers a wider selection of colours for a softer, day time smokey eye (hustle, creep, darkhorse). There is a matte highlight colour in Naked 2- foxy. Naked 1 does not have one but foxy isn't as pigmented and versatile so I don't really miss her there. Both palettes have a light, shimmery highlight shade- virgin (in Naked 1) and bootycall (in Naked 2). They are both nice but I prefer virgin. It is the most perfect shimmery highlight colour. Bootycall is peachier. I also think that naked and buck (matte shades from Naked 1) are great for creating a matte look with some dimension. Also something that is not possible with Naked 2. Is all the hype about Naked palettes understandable? Definitely, YES. The shades in both palettes are beautiful and good quality. Well, it is a matter of taste and your preferences. If you prefer lighter looks with just one lid colour and some eyeliner, you will love Naked 2. It also offers some taupes. But if you enjoy your smokey eye, then I would suggest Naked 1. Definitely, NO. But if you do, you'll enjoy them for sure. What do you say? 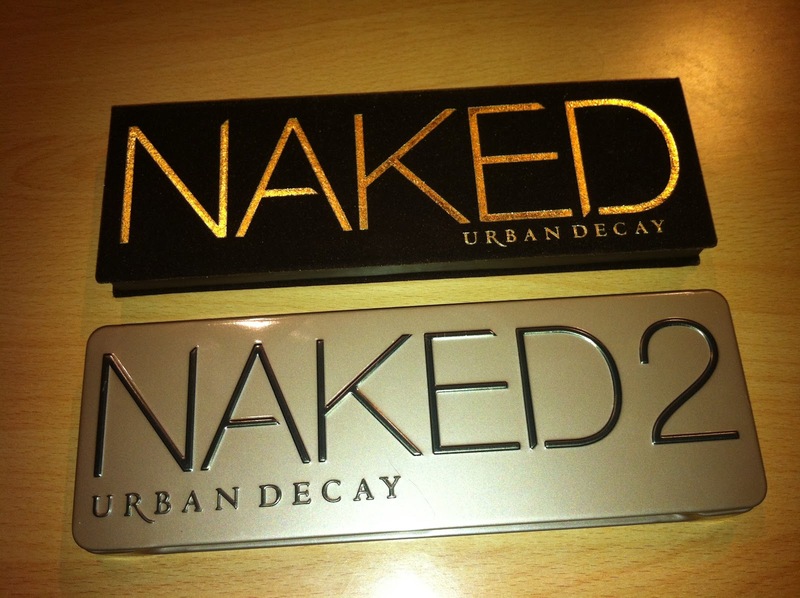 Do you have these palettes? Are you planning to get them? Which one do you like better?